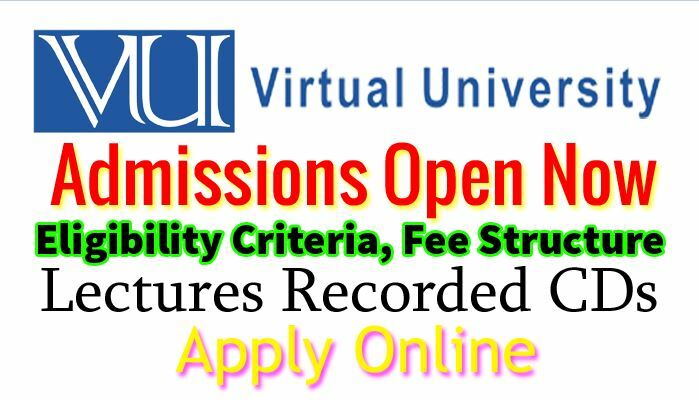 Virtual University Of Pakistan admissions 2019 open for undergraduate, bachelors, post-graduate, certificate degree programs and diplomas. All the students who have freshly done intermediate or bachelors can get admission in this university. It have a lot of campuses in all over the Pakistan. Virtual university provide distance learning opportunity for all those students who cannot join university or college due to some issues. 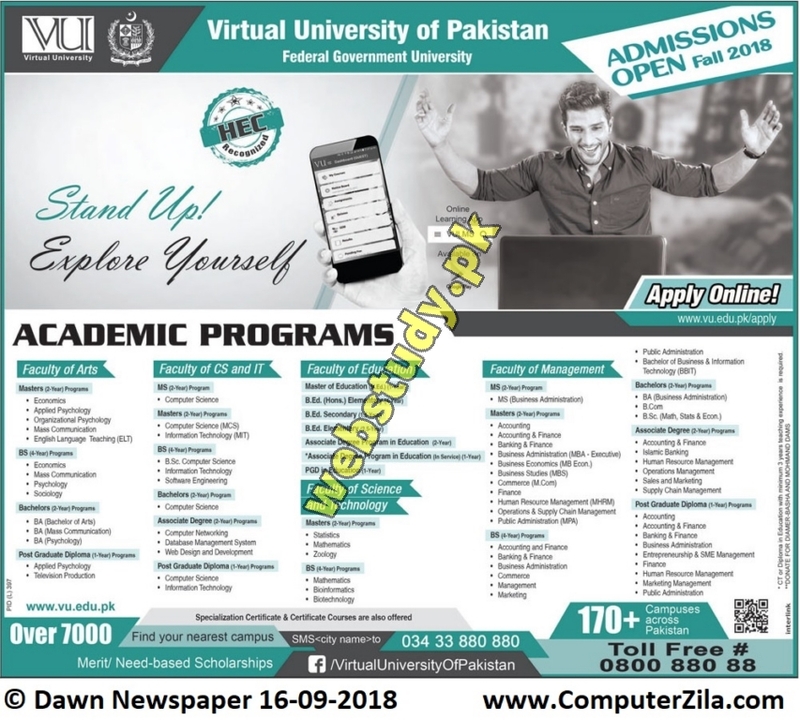 VU Admission 2019 last date is mentioned on advertisement given below and you can get all the details about VU Spring Admission 2019 eligibility criteria here from webstudy.pk. you can also get information about how to download application form, where to submit the admission form, merit list and classes start date. Virtual University of Pakistan have a huge number of programs that they offers. University provide education in semester system. Here in below there are some departments and subjects in which VU offers academic studies. Computer Science and Information Technology, Management Science and Arts. Teachers enhancement programs are also studies there in vu like BS or B.Ed (Hons) programs in computer science, information technology, Business administration, Public Administration, Accounting and finance, Psychology, Commerce, Mass Communication. Masters level programs contains MS in Computer Science, MBA, Msc, MCS etc. Virtual University of Pakistan have a proper admission process through that every student have to go. To get admission in VU student should have done intermediate. Virtual university broadcasts live lectures on tv channels but if a students missed the lecture then they can get the lecture CDs to clear their concept without going to university campus physicaly. VU have a network of campuses in all other the Pakistan for students if they have some querry then they can get resolved from there. There are many colleges are affiliated with virtual university of Pakistan that offers Degree programs in various subjects and departments. Colleges mainly focus on degrees in computer science and management. Virtual university of Pakistan is one the famous university of Pakistan that have huge network of campuses and all campuses are well furnished and managed. All the campuses have basic facilities for students as airy classrooms, well trained staff, air conditioned labs, generator facility in case of loadshedding, highly educated faculty is there to resolve students issues related to studies. Note that all this information about VU admission undergraduate 2019 is collected from different online sources but for authentic news & updates of VU MBA admission 2019 visit official website. To get admission in any bachelors or undergraduate BS 4 years program applicant must have done intermediate with minimum 45% marks. Candidates willing to get admission in VU masters admission 2019 should have 2nd division in annual system or 2.0 CGPA in previous educational session to get admission. All the students who passed the master level with 2.5 CGPA or 50% in annual system are eligible to get admission in MS or Mphil programs. To get admission in PhD programs students must have done 19 years of education and candidate must have to pass vu entry test with minimum 70% marks. Candidates who are willing to apply for admission in virtual university have to purchase Rs 500 Prospectus from university campuses. Students can also get online application form by registering themselves online on official website. Print out that application form and submit your admission processing fee into the bank HBL, UBL, Alfalah. Attach all your required documents along with challan copy of paid admission fee and send it to VU Address given on advertisement. Virtual University of Pakistan fee structure includes admission fee one time, registration fee one time, security fee, admission processing fee, enrollment fee for a semester, tuition fee per credit hour.